"Appreciation is a wonderful thing; it makes what is excellent in others belong to us as well. (Voltaire)"
In the Lesson 2 of Success Mantra (Good Health), we understood the importance of good health and now, we will learn why it is important to appreciate others. We live in a world surrounded by people like us. We all share same basic human needs of love, appreciation, acceptance etc. Today, I am going to write about appreciation and how important it is in life to appreciate others. This is success mantra 3 and you can become a successful person by making it your habit to appreciate others. Now go back in the past and put some pressure on your memory to remember the incidence when someone appreciated you for your good work and how you felt on that day. Every person will give the same answer that he enjoyed the appreciation and felt motivated to work even harder to continue same good work. This is the power of a few words of appreciation. If you want to become a good human being, then you must make it your habit to appreciate the good work of others whenever you came across such a work. We all human need constant motivation and appreciation to continue with the good work we are doing. 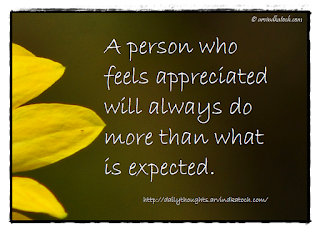 "A person who feels appreciated will always do more than what is expected. (unknown)"
However, it is very important, to be honest with our words and these words should come straight from our heart. In this world, two types of energy are at work, one is positive energy and second is negative energy. Appreciation is positive energy which gives a boost the energy of the person who is appreciated. White the negative energy like criticism work in the opposite by decreasing the energy of the person. There always exist some bad forces in the world which spread negative energies, even if they are doing a good job; and due to these negative forces, many good people leave their good work/jobs in the middle. 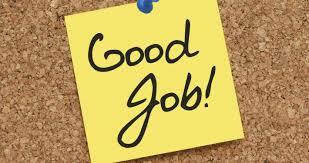 As a good human being, it is our job to appreciate a person who is doing a good job. Our few words of appreciation can be very valuable for a person and he may achieve great height because of these words. Now, it depends on us that what kind of the world we want to create, a world full of negativity or a word full of positivity. By encouraging the right people who full of positive energy, we can create a positive world for all of us. The habit of appreciating others, also make us a better human being in the eyes of others and many people appreciate us back for the kind words. "Every word is made of energy, either it represents positive energy or negative energy. The words you choose decide you are spreading positive or negative energy in the world. (Arvind Katoch)"
2) I appreciate your work/effort. 5) Without you, it was impossible to complete this job. 6) Thanks for being part of my life.